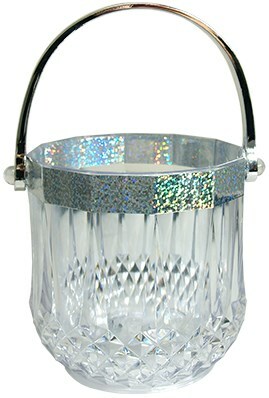 This is a high quality very deceptive mirror bucket which is water tight. You are supplied with this beautiful prop and explanations for 18 effects. With it, you can make items appear, disappear or transform. Secretly switch one item for a duplicate item and no one will suspect a switch was even made! Transform anything that fits inside! Visibly change one item into another! May be used with Slush Powder! Measures approximately 9" from handle to base x 15 1/2" in circumference. Made in the U.S.A.